Bangkok is the capital and a major destination not only in Thailand but one of the biggest cities in Asia. For our purposes, most of the places foreigners are interested in are in the Sukhumvit area, between Huay Kwang MRT in the north, Asoke junction and Nana BTS. Patpong is a little further away by BTS, taking the Silom line and it is a fairly long walk from the BTS station. It maybe advisable to take a tuktuk or a taxi. Bangkok is still the main entry point with two international airports, Suvarnabhumi (BKK) and Don Muang (DMK). Other major international arrivals terminals are Phuket Island in the south, and Chiang Mai in the north, however if you are a first time visitor to Thailand it is unlikely that you would be arriving in Chiang Mai unless you are coming from another part of Asia such as China or Malaysia. Fortunately there are many cheap and frequent domestic flights starting from a few hundred baht one way available to travel from these provinces to the capital. BKK Suvarnabhumi airport is more convenient, it is the newer of Bangkok’s two airports and as you arrive you can take the airport rail link (ARL) run by the State Railways of Thailand to the BTS skytrain and then to Nana or Asoke station depending on whether your destination is Nana Plaza, Soi Cowboy or one of the massage shops on Sukhumvit. The airport rail link also connects with the MRT so you can easily reach the soapy massage parlours on Ratchada. In recent times some of the more famous soapies such as Nataree have run into legal issues but there are still businesses such as Emanuelle, Poseidon, High Class and Ocean massage (formerly Colonze 2) in this area. You can take a taxi there or walk from the MRT station. Do note that separate ticketing systems are used by the BTS, ARL and MRT so you will need to buy different tickets. We recommend buying a refillable, multi use card to avoid the hassle of buying individual tickets each time. Back in the day Patpong was also a hotspot but is kind of crappy these days and more of a tourist trap than an actual destination, the pavements are crowded with vendors selling cheap tacky souvenirs. I guess more people come here for elephant pants, knicknacks and other over priced crap than to visit the bars these days. Patpong is also a fair hike away from the nearest BTS Station so consider this if you are trying to avoid taxis. Soi Cowboy also suffers this problem of having tourist through traffic but Nana plaza due to its nature as an enclosed three story square rather than a street is better. The best area to stay, with the most areas that are interesting for foreigners and access to the BTS and MRT, is Sukhumvit. Nana is located on soi 4. The even numbered sois are on the south side, one end of Soi Cowboy is on Rachada, the other is on Sukhumvit soi 23. Actually soi 23 is an interesting one, many people don’t go further than the entrance to Cowboy but if you do you can find many massage shops that offer good services for a reasonable price. Just turn left as you exit soi cowboy from Ratchada side, and then keep going you will see massage shops on the east side of the road, on your right as you are walking north. Ladies will be sitting out the front and call out to you. Cowboy is fairly expensive and most of the bars are coyote dancers, some of whom do not go out. The staff should explain this and point out to you which ones these are when you enter. Crazy House is an exception and is actually not on Cowboy itself but on Sukhumvit soi 23, it is popular with expats for the upstairs area which is more interactive and hands on than most Cowboy bars. Certain bars such as Baccara are notorious for preferring Asian clientele and if you are non-Asian you may be asked to buy a drink outside first before going in. There are also a number of famous oral bars such as DR BJ and Lolitas in the sois around Sukhumvit, as well as countless Asian massage parlours (AMP). What goes on in this places is generally negotiable. You can also visit the famous Thermae café in the basement of the Ruamchitt hotel which is located midway between Asoke and Nana BTS stations. This is not really a café. It is a basement room where dozens of freelancers, mostly part time sideline girls go to pick up customers. You will know you found the right place because there are ladyboys hanging around outside, they are not allowed inside. You can take out your preferred choice to your hotel or use one of the Ruamchitt hotel’s rooms for a short time for a minor cost of a few hundred baht. Go in, take a drink from the bar – they have a selection of drinks and food available – and have a seat in the middle area. At Nana plaza you will see some bars on the outside and also the Nana hotel across the road. The parking lot of the Nana hotel is a notorious pickup location for freelancers. You may as well negotiate here since there is no set fee and what one lady will reject, another might accept. 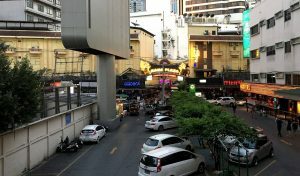 Usually you can go to the Nana hotel itself or there are other short time hotels nearby including in Nana plaza itself. Some bars worth visiting in Nana are Diamond, Rainbow (2, 5), Spankys and Angelwitch if you like rock shows. Outside of the scene geared towards foreigners there are also kapoo clubs aimed at Thai clientele. These provide body to body (B2B) massage and sometimes more. They are not advertised towards foreigners but it is unlikely you would be refused. Just go in and see. We have a guide to help you available, see our explainer on b2b massage. 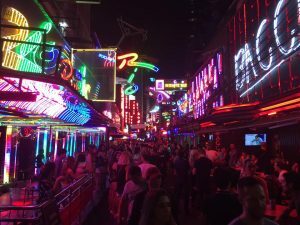 You can also try your luck in the clubs and bars of RCA, but you will need deep pockets and Thai style nightclubs are not the same as in the West. Groups buy a bottle and take a table, and it is difficult to break into a group. There is no real dance floor area, just tables. If your interest runs to Western backpackers then there is always the famous Khao San Road (KSR). Some Thais go there to hang out with foreigners so you may be in luck. But mostly the bars are packed with the young backpacker crowd so there is no real reason to go there if you come from a Western country as it is pretty much the same as the more lowbrow night life areas in your home country. KSR is also a bit of a pain to reach as there is no MRT or Skytrain access, you will need to negotiate with the taxi mafia and of course due to the high density of tourists, there are a number of scammers and touts. Better to just avoid the area entirely. From BKK you can also easily reach Pattaya by airconditioned bus. Tickets are cheap around 140 baht. If you prefer to take a taxi it will set you back 1200-2000 baht depending on how good you are at negotiating, the real price is close to 1000 but you will most likely have to pay a farang tax. Some taxis will simply take you to a third location where you will be put into a private car and driven the rest of the way to Pattaya, so that the taxi driver can stay in BKK. Try and confirm with the driver that he or she will take you all the way to your destination.